Greeting cards are pieces of paper or cardboard upon which photos, drawings, and a verse of cheer, greeting, celebration, condolence, etc. have been printed or engraved. Greeting cards are decorated with a variety of images and include messages to appeal to diverse audiences, sentiment, and occasion to be remembered. Greeting cards are easily made at home using pen and paper or software sold by greeting card and other companies. Recently, virtual cards that include images and verse can be sent to someone by way of the Internet and e-mail and may be printed out on paper by the receiver. Despite the electronic availability of these cards, the greeting card industry continues to sell cards in retail store in huge numbers. Over 1,500 greeting card manufacturers sell an estimated seven billion cards each year. Each household receives an average of 80 cards annually. The market research associated with the development of a successful greeting card is just as important as attractive graphics or appropriate verse. Research has pushed large greeting card companies to expand traditional product lines and offer cards for pets, step-siblings, divorce, weight loss encouragement, company lay-offs, and more. Some smaller greeting card companies specialize in the production of cards that appeal only to one or two specific markets. Greeting card companies require a diverse talent pool in order to produce commercially-successful product, and these forms employ everyone from cartoonists to market researchers to pressman who print the cards. Some speculate that ancient Egyptians may have recorded greetings upon papyrus and sent them via messenger to the intended parties, and it seems plausible that the ancient Greeks recorded sentimental verse on scrolls, as well. By the late Middle Ages, letters and messages of love, including romantic verses sent near St. Valentine's Day, were exchanged throughout Europe. Personal messages of greeting and sentiment were individually crafted until the mid-nineteenth century. The first commercially-produced greeting card was a Christmas card invented in 1846 by British businessman Henry Cole who asked a printer to produce a printed Christmas greeting he could quickly send to friends. The idea caught on and mass-produced Christmas cards were popular by the 1860s. Louis Prang, an American printer who invented a multi-color printing process called chromolithography, fashioned beautifully colored cards by the 1870s. Cards for Easter, birthdays, baby arrivals, etc. soon followed. The larger American card companies were founded in the early years of the twentieth century and a number exist today and remain leaders in card sales. Innovations in card production have primarily revolved around developing efficient printing methods, diversifying the product offering by nurturing a large creative talent pool, and devising more effective point-of-sale displays so consumers can easily see the products in an attractive display. Greeting cards are made of card stock that may be of wood pulp or part "rag" (textile waste)—sturdy, fairly expensive paper. Increasingly, these card stocks are being made with recycled materials. Many, but not all, of the companies put a glossy aqueous coating consisting of water and a water-based acrylic coating on the stock after printing particularly when a photograph is featured. Inks vary as well. Many companies are moving toward the use of soy inks, containing water-based solvents and are more easily cleaned, recycled, or disposed of than oil-based solvent inks. Soy ink composition varies with the printing process; cards are most often printed using sheet-fed printing and the soy ink for that includes between 20%-30% soybean oil, resins, pigments, and waxes. The manufacture of greeting cards varies greatly depending on the size of the corporation. Successful greeting card companies put a great deal of importance on business research, marketing, and creative design because these help determine what cards will sell well. 1 Generally, before the artists and verse writers begin to put pen to paper, large companies support in-house researchers that learn all they can about potential buyers. These researchers find out all they can about consumers' wants, needs, and concerns that can be addressed in a greeting card not already in production. The researchers use statistical analysis, market research, and research on lifestyle changes. Once the Research Department has an idea for a new card line, they utilize focus groups, surveys, and controlled store tests to gauge the potential of the new product. For example, research may indicate that changes in the American family calls for cards that acknowledge step-siblings, or suggest that soaring numbers of cat owners will lead to a successful line of cards offering sympathy on the death of a pet. 2 Smaller greeting card companies sometimes contract designers to provide sketches and ideas they feel will be good sellers and fit their niche markets. However, in larger companies, the Research and Marketing departments work closely with the Creative Department in order to collaboratively devise a new card. These larger companies employ an in- house creative staff that includes artists, graphic designers, photographers, writers, editors, and copywriters. This staff provides the illustrations and verse featured in the product. The Creative Department "marries" the sketch to the appropriate verse and creates a hand-made card. 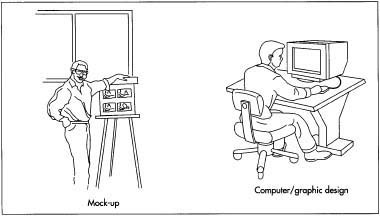 Once the Marketers and Researchers are pleased with these mock-ups are examined and rated by consumer panels or focus groups. The prototypes deemed most marketable are then moved into technical production. 3 When the designs are approved to for production, graphic artists and technical production assistants are key to translating original artwork and scrawled words into a pleasing, coordinated product that can be mass produced. Thus, graphic designers might re-size artwork to make it fit a card, add color underneath or on top, combine images with appropriate typefaces for the verse inside, etc. The graphic designers must understand the capabilities of the printing machines and use only those numbers of colors that can be successfully and economically printed. Artwork, transparencies, etc. and verse are united in a mock-up that is approved for further development. When approved, all the specifications for the approved card—everything from the illustration on the front to the verse inside to the UPC code and price on the back—are scanned or input onto a computer disk and sent to the printer. Large greeting card manufacturers have creative departments that design both the prose and artwork of a card. After the artists and writers produce their portion of the greeting card, each element is incorporated into a handmade mock up of the final product. Next, graphic designers translate the mock up into a card that can be mass produced. Oftentimes, artwork is resized, color is adjusted, and the fonts used for the typeface is changed. When the mock up receives final approval, it is digitized and sent to the printer. four plates per card. The plates are now ready to print. 5 It is important to note that before an entire run of cards is processed, a couple of examples are run off and submitted for "proofing." The designers, marketers, graphic artists, press operators, etc. examine the card and check it carefully to ensure the imprint is of acceptable quality. Minor color corrections or ink adjustments occur before the print run can proceed. When the proof receives the sign-off, mass-printing begins. Greeting cards, often printed in runs of 400,000 or more, are often printed using sheet fed offset printing that permits the printer to print between 4,000-18,000 sheets per hour. When ink and a fountain solution (water with chemical additives) are applied to the laser-burned metal plate in the right proportion, the image to be printed accepts ink but repels the fountain solution. The non-image (white or background area) attracts the fountain solution and repels the ink and is left unprinted. From the plate, the image is applied under pressure to a rubber canvas called a blanket. From the image is then transferred onto a sheet of paper. The sheets of paper to be printed, about 20 x 35 in (50.8 x 88.9 cm), are put on the press mechanically. The press grabs a single sheet of paper at a time, generally printing all of the black images and words first, then moving quickly to the next metal plate (which applies a different color of the design) without allowing time for drying the just-applied inks. While on the press, an aqueous coating (that provides shine) is applied to the just-printed card by another plate. The cards then air dry for approximately five to six days. 6 After the sheeted cards are completely dried, they are cut into individual cards from the larger sheet by a die cutter. The sheets are inserted into the die cutter and an apparatus that resembles a cookie cutter cuts them apart in one stroke. The cards are now a long strip that is yet unfolded. 7 The card is then sent to the folding machine where it is creased and folded automatically. Cards are often packed by hand and assembled with their envelopes in carton quantities of 700. At the printer, greeting cards are printed on a sheet-fed offset printing machine. 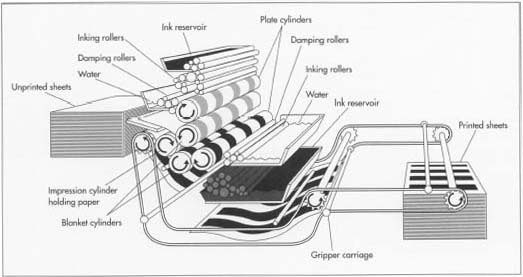 When ink and a fountain solution are applied to a metal plate that has had the greeting card pages laser burned onto it, the image to be printed accepts ink but repels the fountain solution. The non-image (white or background area) attracts the fountain solution, repels the ink, and is left unprinted. From the plate, the image is applied under pressure to a rubber canvas called a blanket and it is transferred to the paper. The sheets of paper are mechanically fed into the printer. The press grabs a single sheet of paper at a time, generally printing all of the black images and words first. A different metal plate is used for each color of the design. Inks are applied in sequence without allowing time for just-applied inks to dry. A top gloss coating is applied as a final step. folding machine operator monitors the quality of the completed card. He or she is able to now see the card completed and ready for sale; this person has the prerogative to pull inferior cards (poorly printed, badly cut or folded) out of the line and jettison it. The use of soy ink has greatly decreased solvent disposal problems for the printer. Soy ink does not release a significant volume of volatile organic compounds (VOCs) into the air when it dries. VOCs are chemical compounds that evaporate and react in sunlight and form smog at lower atmospheric levels. Soy ink is not 100% biodegradable, but it is far more biodegradable than oil solvent-based inks. Furthermore, soy ink is more effectively removed from papers during recycling, resulting in less paper damage and a brighter paper. The use of soy ink helps printers meet the federal Environmental Protection Agency's clean-air standards. Waste papers are generally recycled by the printer as well. The future of greeting cards seems strong, with card sales for one company alone reaching nearly $4 billion last year. However, two very recent developments may affect the future of the greeting card industry tremendously—perhaps adversely. The first is the software available that allows consumers to create their own greeting cards (with the assistance of easy-to-use programs) using a personal computer and a color printer. Some card manufacturers created this software for sale; so, they see profits when the software is purchased, but it may reduce sales of store-bought cards. The second development is that anyone with Internet connections may send a free cybercard that can be taken off of a website and sent via e-mail. They may be obtained through any one of dozens of websites, require no postage stamp, and may be sent in an instant. In addition, many such cybercards feature sound, music, and animation. Even the large card companies offer such cards and they are often free-of-charge. It remains to be seen whether the new cybercard will affect over-the-counter sales of paper greeting cards. Hirshey, Gerri. "They Feel For You: Hallmark writers." The New York Times Magazine (July 2,1995): 20. American Greetings. http://www.american-greetings.com/ (June 28, 1999). Greeting Card Association. http://www.greetingcard.org/ (June 28, 1999). Hallmark Card. http://www.hallmark.com/ (June 28, 1999). I am in the process of beginning my own business and need to know where to get a machine/printer to make my own cards. Or a place I can go where I can go at a reasonable rate. Graham reminds me of ashley smith for some reason.